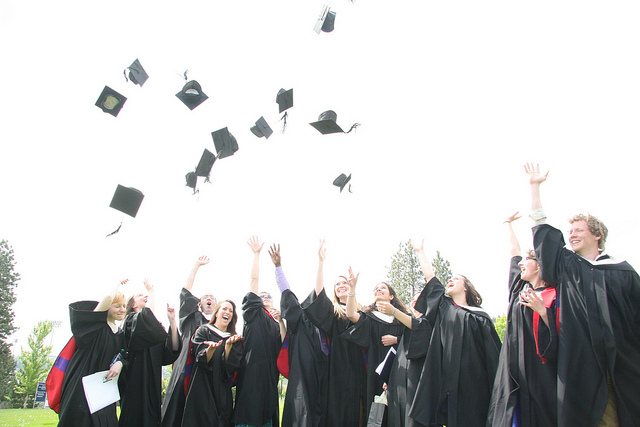 Have you ever considered giving promotional gifts to new grads? Some 1.8 million college grads are entering the workforce this spring – and promo gifts are just the way for your brand to get on their radar. New grads might turn out to be potential customers, or who knows, they might even end up working for you. Make sure they know about your business – and that they feel positively about it. The key is to give grads something useful. They’re moving up from the college world to the working world, and the right promo items can help them transition (while getting your brand some nice exposure in the meantime). 1. A functional custom laptop bag. However they were schlepping their stuff in college likely won’t cut it anymore. Help new grads appear polished and professional in the workplace with a great-looking laptop bag. 2. A handy promotional travel tumbler. Now that grads are commuting to the office or job interviews, they’ll appreciate a sophisticated, attractive way to sip their morning coffee. 3. A stylish custom jacket. As they pack up their university logo hoodies and sweats for more corporate-ready apparel, think about giving grads a promotional jacket they’ll be proud to wear around the office and to client lunches or after-work drinks. Consider a tone-on-tone logo so the branding is subtle. 4. A promotional lunch bag with some flair. They’re not eating in the dorm cafeteria anymore. New grads will get a lot of use out of a fashionable, reusable lunch bag – and you’ll be helping them save money on lunches out, too. 5. A promotional picture frame. Help new grads spruce up their workspace or new digs with a custom photo frame. It’s best to go neutral – think silver or black – so it meshes in any corporate environment. 6. A custom business card holder. When grads land a job after college, it’s exciting getting that first batch of business cards. A stylish business card holder lets them display their professional chops while keeping your logo always visible. 7. A gourmet food gift. After years of Ramen and mac and cheese, grads will welcome a more sophisticated snack. You could opt for an elaborate gift basket or keep it simple with individual packages of treats. Even better if the food gift includes another promotional item like a mug, box, picture frame, or cutting board. 8. A cool promotional speaker. Gone are the days of blasting music from their roommate’s computer. Give grads a sleek, portable way to listen in their cubicle or at home. 9. A sophisticated custom coaster set. As grads upgrade from the hand-me-down furniture of their college years, give them a way to keep their new stuff looking spiffy. Custom coasters are a creative way to give your logo a permanent home on grads’ coffee tables. 10. An engraved promotional pen. Whether it’s a job interview or an important meeting, new grads exude professionalism when they pull out a sleek-looking writing instrument. And, hey, they don’t have to be expensive to be expensive-looking. 11. An interesting custom desk accessory. Give grads a unique promo item for the desktop and your brand becomes a topic of conversation in the office. Just make sure it’s functional or it’ll never get used (or seen). 12. A custom cell phone charger. Nobody wants to stay tethered to the wall while their phones charge. And nobody likes packing a gazillion power cords while traveling. Grads will get a ton of mileage out of a promotional cell phone charger or power bank. 13. A professional-looking custom padfolio. Grads can use a promotional padfolio to transport resumes and cover letters to job interviews, and when they do score that first gig, it comes in handy in the workplace, too. 14. A nice promotional corkscrew. Cheers to new grads! Since dollar beer nights are in their past, they can make the shift toward more refined imbibing with a custom corkscrew. So, there you have it: 14 great promotional gifts for grads that’ll be useful to them in their new endeavors and provide excellent exposure for your business. Small Business: Are You Giving Holiday Gifts?